Admit it, you love me. 22 Responses to "Photos: New Photos of Robert Pattinson as Georges Duroy"
how long they are going to shooting in Budapest?? Are Uma there too?????? This has become my new favorite site. I can’t wait to see Uma in her costumes too. 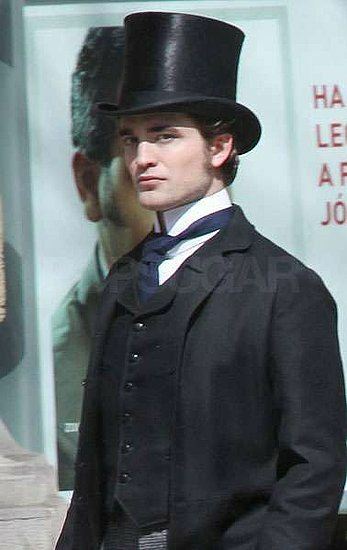 I swear Rob was made for these period clothes. They just “suit” him. Some actors would look a bit foolish in these clothes. It’s like Rob was meant for them. He just looks so distinguished. And Kristen looks great as always. I love the detail on her dress. Was that too much gushing? LOL! Wow, this man is going to kill us all. Will go with someone to the cinema who knows CPR otherwise I’m not going to survive! Rob needs to be chained for killing so many women LOL. But I wouldn’t put him to jail…*evil laugh*. God, does this man know how many victims of his hotness suffer now? incredible your site and I love the Rpattz photos….he is an angel…. If you look closely all the pictures are watermarked with PopSugar. Yes, but they stole from the HUNGARIAN site! all of these pictures are taken by hungarian fans.there’s no foreign “press” on location,or at least there weren’t any yesterday and neither today. OMG, the black leather gloves. Why oh why do they tempt me so?? Can someone please explain…I just finished reading the book last night but a lot of the characters and scenes I’m reading about in the movie were not in the book. Do I have an old version of the book? Anyone know where I can read the script? i don’t think my lady bits are gonna survive bel ami’s shooting! all these beautiful, fuckhawt pics of this gorgeous man . . . . . THUD!! Can you say D.I.E.D. ?